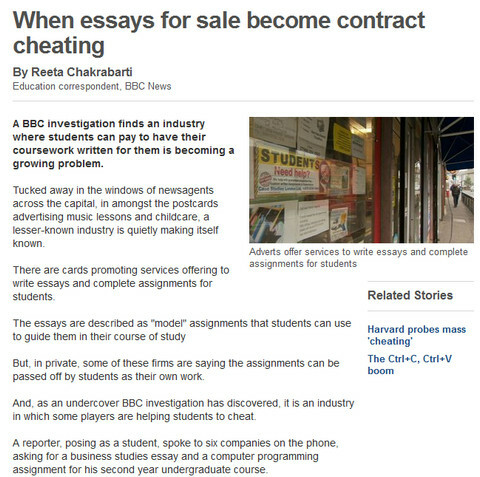 Here is one of the more interesting contract cheating media studies of 2012, provided by BBC News and looking at essays for sale and contract cheating (a video version of the same news story is also available). The story discusses the wide range in which students become knowledgeable about contract cheating opportunities, including advertisements placed in the window of shops. Most usefully are the type of assignments received back from such services. This is something that is very difficult for academics to test due to the ethical implications. This revealed a £70 and £125 assignment, both of which were of a low standard, but good enough to pass. A third assignment, also costing £70, was judged to be of a 2:1 standard. This does demonstrate a variety in the quality of assignments received across different subject areas, showing that there are some elements of “pot luck” involved with picking essay writing companies, but if students are just aiming to pass an assignment, spending this money could be worthwhile. And, our other contract cheating research involving auction sites have shown that there are ways to spend far less than this.